I love rotisserie chickens, especially from Costco because they’re so cheap and are generally larger than those you find in the regular grocery store. But we never finish ours, and it drives me crazy that I can’t pick every piece of meat off the bones. That’s why I use the leftover carcass to make either broth or soup. It’s ridiculously easy to do, and it turns out a decent meal with minimal effort. Seriously minimal effort. If you’re uber lazy or pressed for time, buy pre-cut veggies and cut your prep time down to nothing. Step 1: Buy a rotisserie chicken, cut it up, and use it for lunch/dinner. Step 2: Cut the carcass in half and place it, any leftover meat, and all the juices and gelatin at the bottom of the container in the slow cooker. We had both wings, both drumsticks, and one thigh left on our chicken. 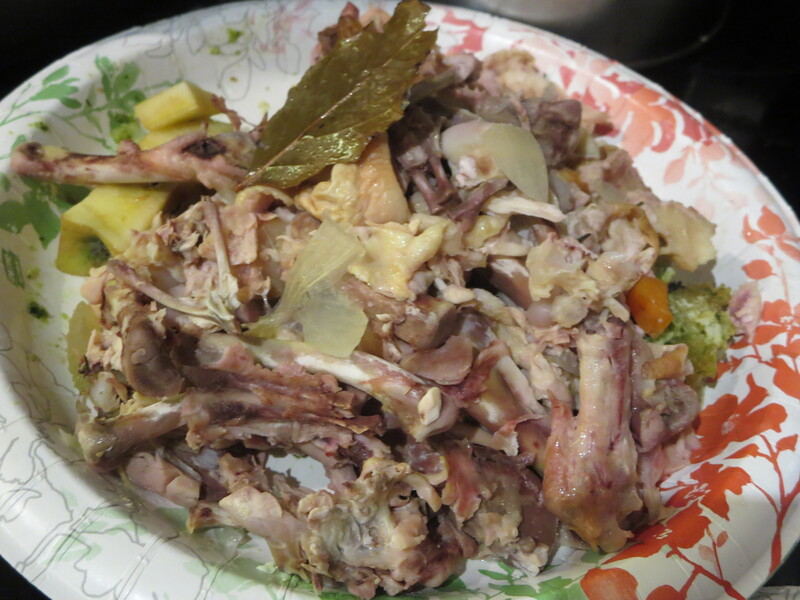 In terms of flavor, the more chicken the merrier, so if you have several carcasses, throw them in. Step 3: Chop 1 large onion, 4 carrots, and 3 celery stalks. Cut 1 clove of garlic in half. Add to slow cooker. Notice I didn’t peel the garlic. So easy. Step 6: Taste the broth for seasoning. 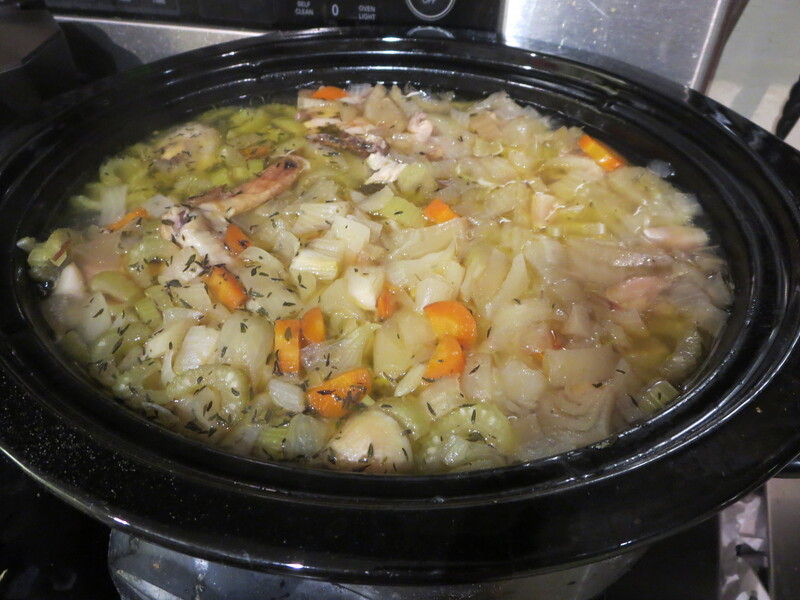 Since we didn’t have that much chicken in our broth, I added about 2 tsp of chicken bouillon granules to put it over the edge from good to oh my goodness, I’m so happy. Step 8: Add precooked noodles and enjoy chicken noodle soup. Or, if you’re like my daughter, just enjoy it as-is. 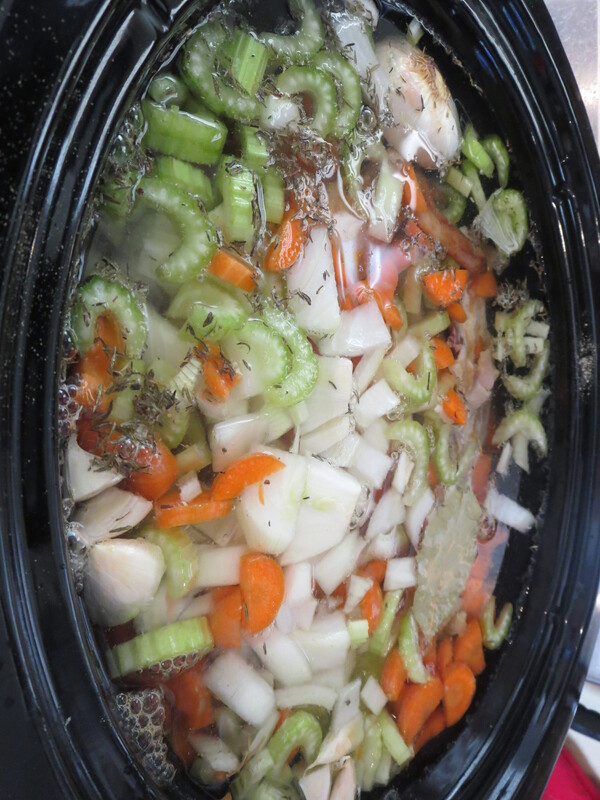 Add all ingredients to slow cooker and fill to the top with water. 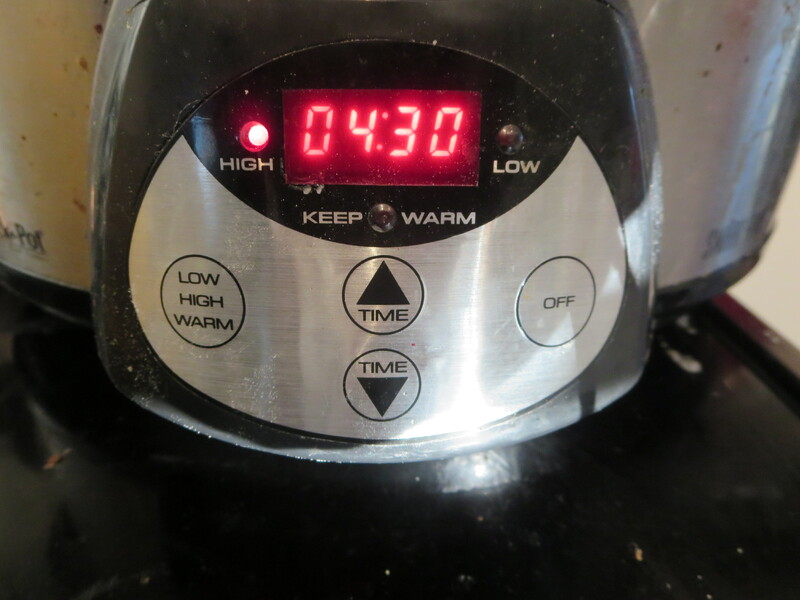 Cook on high for 4.5 hours or on low for 8-10 hours. Taste for flavoring. 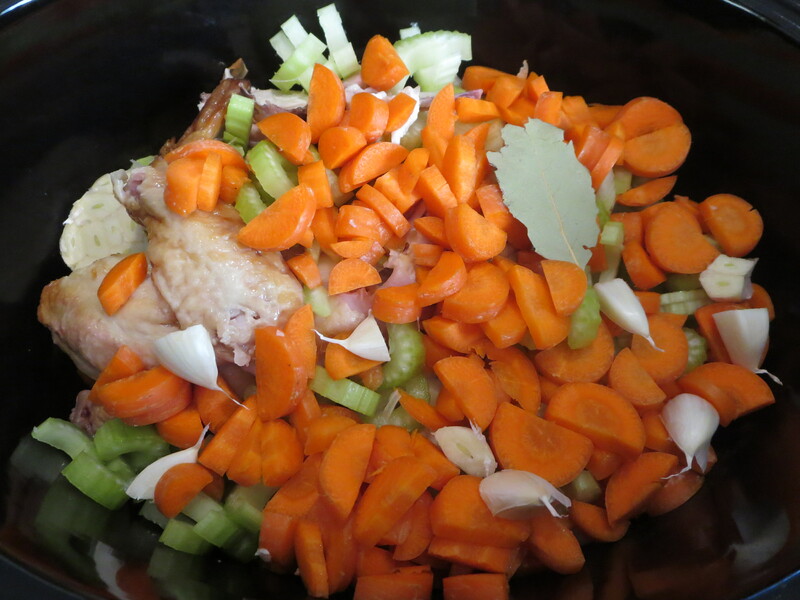 If not “chickeny” enough, add up to 2 tsp of chicken bouillon and stir. Strain liquid into another container and use in something else. 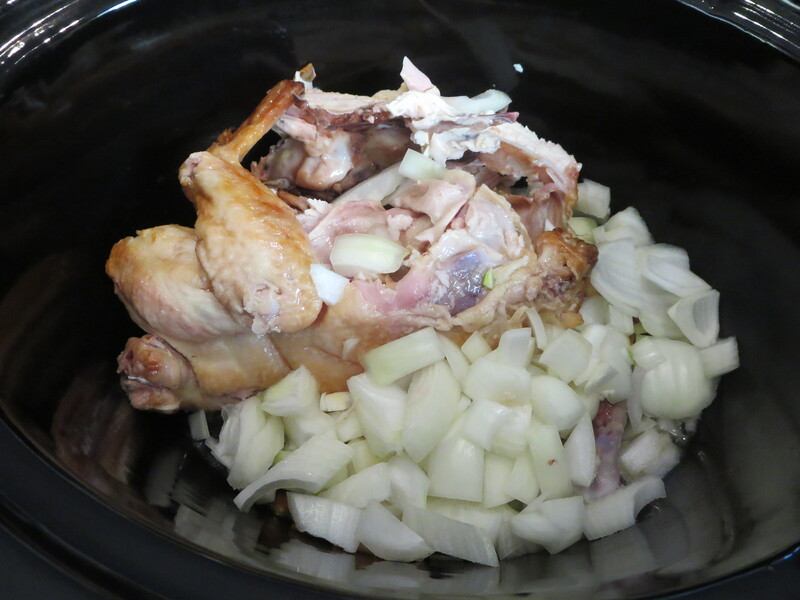 Pull the chicken bones out of the broth and peel the remaining meat from them with either a fork or chopsticks. 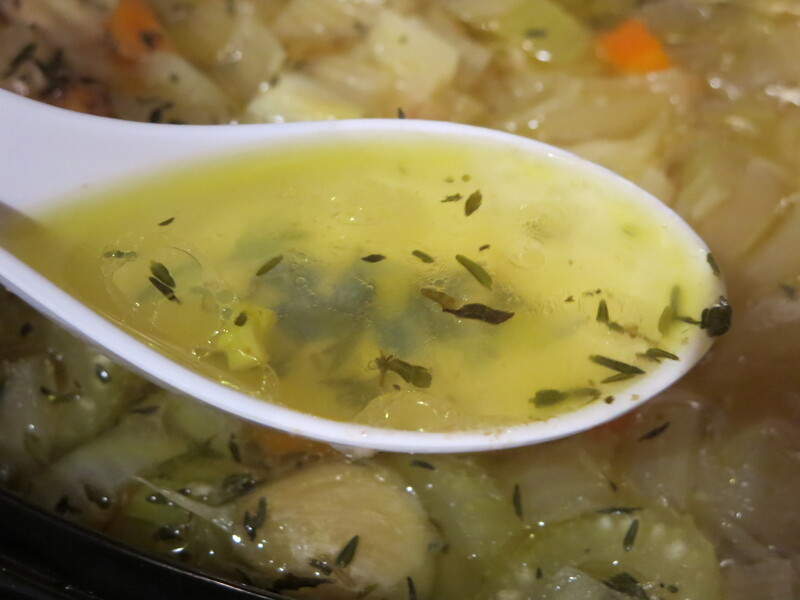 Using tongs, squeeze the garlic head halves and put the now roasted garlic back into the soup. Cook your choice of noodles in salted water until al dente. Drain and add desired amount to serving bowl. Top with soup and enjoy. This entry was posted in Daily, Recipes.